Kollywood has had a lazy start this 2016.Other than a few big budgeted flicks, there weren't many that left a lasting impression on us. Maybe that is because the moviemaker's decided to save the best for the last. As 2016's second half has started rolling, we list out the unmissable movies which you ought to watch when they release this year. 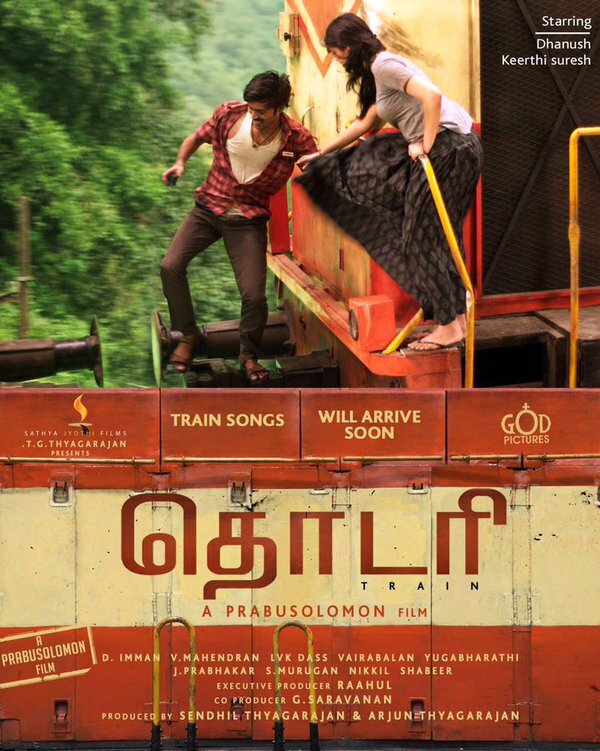 Thodari seems to be much different from the usual fare. Dhanush & Keerthy Suresh are the lead cast of this thriller. The film revolves around a train which is hijacked by some anti-social elements. Dhanush, who is a pantry section worker, is shown as the negotiator between the cops & terrorists in the trailer. It has Superstar Rajni. Do we need to say more? Since its first clap, his fans & avid moviegoers have been watching every development of Kabali very keenly. Its stills, trailers, song teasers, nearly everything related to the flick has gone viral. Given Rajni's larger than life image, Kabali, which is releasing on July 22, will certainly make waves when it hits the screens. Dharma Durai was a Superstar Rajni starrer which went to set the cash registers ringing when it released in 1991. Now, the moviemakers of the Sethupathi starrer are using the same title. Aishwarya Rajesh, Shrushti Dange & Tamannaah Bhatia are the lead actresses of this much-delayed flick. The teaser, which was released on June 1, was quite interesting. The audiences will be seeing Sethupathi in three roles which appear to be very different from one another. Jiiva & Nayanthara star in this rustic film which shows Jiiva in a different avatar. The movie made news when Nayanthara, as part of the script, went to a roadside wine shop & brought a bottle of beer, much to the shock of the onlookers. The moviemakers released its audio in March 2016. The movie can be expected to release this year as its shooting was completed a long time ago. Kodi is political thriller whose shooting had begun in January 2016. However, due to the Chennai floods, it got delayed. It was further delayed to the moviemakers inability to secure a heroine in a swift manner. After much ado, they signed on Trisha & Anupama Parameswaran to star next to Dhanush. Interestingly, Dhanush will be seen in dual roles in this thriller which is produced by Dhanush himself. S3 is Tamil Cinema's first threequel. That said, it marks the return of the dashing cop Singham who singlehandedly annihilated two crime syndicates in his previous outings. The action quotient has steadily increased in the first two instalments. One can expect S3 to pack a powerful punch for it is our intense actor Suriya at its helm. The film is expected to release this Diwali. This is another one of those films which tries to harness the curiosity surrounding the secretive RAW. The difference between this & the others is that the Iru Murugan director, Anand Shankar, wants to represent RAW as accurately as possible. Of course, for the entertainment purposes, the director has mixed a bio-virus angle into the plot-line. Another plus is that it has got experienced actors Vikram, Nayanthara & Nithya Menen as its lead cast. This movie title has been associated with horror films since ages. With Karthi's films, one can certainly expect some decent entertainment. As it is a horror film, chills & thrills will be ingrained in the flick. Nayantara & Sri Divya are the lead actresses of this flick. As per the director Gokul, Nayantara plays a princess & Sri Divya a journalist in Kashmora. Prabhu Deva is desperate to regain lost ground. Paired opposite Tamannaaah Bhatia, Devi(L) is a horror film which has been kept under wraps. Except for revealing that Tamannaah will be seen as a village belle, not much is known about the movie. The moviemakers are aiming to release the movie in September.